The above poster came straight from iTunes Movie Trailers, so we are fairly certain that it wasn’t just the work of a bored teenager wasting his time with Photoshop instead of cleaning his room. Paul Middleditch’s upcoming dark comedy Rapture-Palooza looks absolutely amazing, full of absurdist humor and surreal situations. In a year strangely full of post-apocalyptic comedies – such as the “Seth Rogen ‘n’ Friends” flick This is the End and Edgar Wright’s The World’s End - Rapture-Palooza’s red band trailer put it out in front as far as zany subject matter. So why does this poster read 1992 direct-to-video? I’d try and seriously consider how generic it looks, but it’s kind of impossible, even though I like the way the pitchfork is used as the letter E in “rapture.” Silver linings, if nothing else. 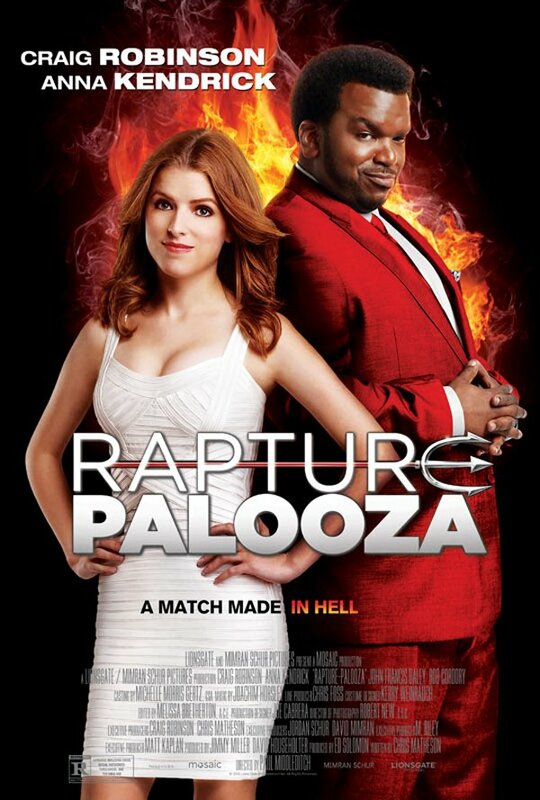 Seeing Craig Robinson in anything is a plus, but having his Antichrist character stand next to Anna Kendrick in front of a flame graphic is a step down from even the lamest Office episode. Why does co-star John Francis Daley (Freaks and Geeks) have to get shafted? The film will follow Daley and Kendrick as a married couple who find themselves trapped on Earth after the Rapture hits, and the world is now full of talking crows and a laser-beamed Jesus and general malaise all around. Robinson appears and aims to bring Hell to Earth, but not if our lead couple can help it. These characters are joined by a bunch of co-stars, including Ken Jeong, Rob Corddry, Thomas Lennon, Tyler Labine, Rob Huebel, Paul Scheer and Ana Gasteyer. The film comes to theaters and to VOD on June 10th, hopefully with a better poster out by then. Check out the trailer below if you missed it the first time. Remember, red band means NSFW.